Technology historically plays the role of a disruptor, the means to newer and better things, and the destruction of old ways of life. 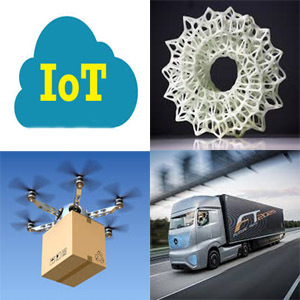 The following four technologies are sure to disrupt the business of logistics. The technology of 3-D printing makes it possible for manufacturers, other businesses, and even individuals to print exact working replicas of parts and products using metals, plastic, composite materials, and even human tissue. The impact on logistics will be significant. A car manufactured in a factory has about 30,000 parts. A 3-D printed car has just 50 parts. 3-D printing could lead to consolidated manufacturing in one location rather than sourcing parts from all over the world, leading to a fall in shipping and air cargo volumes. The mass customization of products would mean that inventory levels would fall, leading to a reduced need for warehouse management, as products are made to order. Major companies such as Nike, Gillette, and Mattel are already using 3-D printing or have filed applications to do so. Shipping line Maersk has installed 3-D printers on some of its ships to make spare parts in the event of breakdowns. Large logistics companies like UPS are also investing in the technology. UPS is looking into taking orders from customers, printing them on 3D computers, and delivering them. This revolutionary technology allows devices to communicate with each other through an internet-like infrastructure, without human intervention. Research firm Gartner forecasts that 6.4 billion connected things will be in use worldwide in 2016, up 30 percent from 2015. A McKinsey survey in 2015 predicted the economic impact of the IoT to be $11 trillion by 2025. Companies providing logistics software solutions could find multiple uses for IoT, which would help them to increase speed, reduce waste, and pare costs for their customers. For example, IoT could be used for asset tracking, inventory management, filing of orders, and predictive maintenance, among others. Amazon made headlines when it announced that it was looking into the possibility of using small unmanned aerial vehicles, known as drones, for making last-mile deliveries. While there is still a lot of uncertainty over when drones will be available for commercial use, given the need for approvals from the Federal Aviation Administration, they could be a game changer for the logistics industry. Drones would help reduce the cost of delivery, would be easier to track, and would likely be an attractive draw for the end customer. Driverless vehicles are set to become a reality. Google submitted a proposed design for a self-driving car to the U.S. National Highway Traffic Safety Administration (NHTSA) in November 2015. In February 2016, the NHTSA replied that the artificial intelligence system that pilots the self-driving car could be considered as the driver of the car under federal law. This is a major breakthrough, and could pave the way for the faster development of such cars. At present, there are cars on the market that can be “driver-less” under some conditions, but there is no fully driverless vehicle in use yet. Driverless vehicles could become an integral part of a logistics software solution, reducing the turnaround time of orders and human error, and ultimately helping companies save costs.